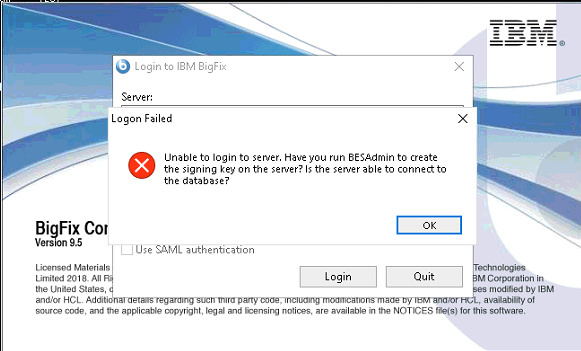 Have you tried running besadmin? Is this a new server? yes BESAdmin tool is running smoothly. but console is unable to login . Mon, 04 Feb 2019 16:30:50 +0500 - Main Thread (3456649344) - Have you run BESAdmin on the server yet? Mon, 04 Feb 2019 16:30:55 +0500 - Main Thread (3456649344) - Have you run BESAdmin on the server yet? Mon, 04 Feb 2019 16:31:00 +0500 - Main Thread (3456649344) - Have you run BESAdmin on the server yet? Mon, 04 Feb 2019 16:31:05 +0500 - Main Thread (3456649344) - Have you run BESAdmin on the server yet? Suggest you may need to open a PMR with support on this. It looks like something went wrong in your installation. I think now it is required to open PMR for this issue. Installation has been done 2-3 months back , during this time BigFix was running very smoothly. After facing this issue, I have tried these commands. all these commands run smoothly. Now the error is change. Check if the Server service is running. Restart the Server service and check the Server log for errors. Is Console located on the same box as Server? Also try to use an IP address of a Server instead of it’s hostname in a Console login window. Is there a proxy between Console and Server?